Practicing Patience and Mississippi Hotdog! If a child hears fine music from the day of his birth and learns to play it himself, he develops sensitivity, discipline and endurance. He gets a beautiful heart." I was a clenched teeth determined single parent, vowing that my daughter Jill was not going to miss out on any two parent advantage. So, when she brought home a signup sheet for Suzuki violin lessons, I rented a violin for her and hurried to buy a Suzuki Method book for her to practice with and for me to study after she went to bed. I knew she was on her way to her debut at Carnegie Hall. I saw her bowing to seven standing ovations, with me, her relentless stage mother, a protective hovering shadow on the curtain. That was before I knew that Twinkle, Twinkle Little Star, alias Mississippi Hot Dog, was going to be the major song in her repertoire and stick in my musical mind for months. Gradually, I learned the bare Twinkle Twinkle Little Star facts. Twinkle Twinkle Little Star comes from a French rhyme, "Ah! Vous dirai-je, Maman," that originated in the first half of the 18th century. A list of classical composers including Wolfgang Amadeus Mozart, Camille Saint-Saens, and Franz Liszt, have written variations on Twinkle Twinkle Little Star for paino, clarinet, and organ. Shin'ichi Suzuki based his variation of Twinkle Twinkle Little Star on the violin, and for his time, some radical ideas for teaching music to children. 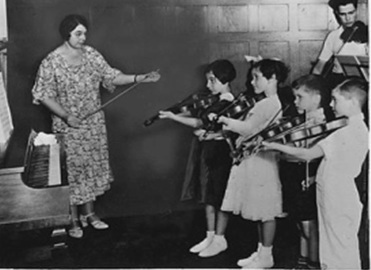 He believed that even young children could learn to play the violin or any other musical instrument if they took small enough learning steps and the instruments were scaled down to fit their size. Carrying on the Twinkle, Twinkle Little Star musical tradition, Suzuki changed the rhythm pattern to match his title, Mississippi Hot Dog. I had nothing against Mississippi or hot dogs separately, but together they created discordant notes at our house. At the time, we lived with our friend Nancy and her dogs Clancy and Clara. The first night that Jill brought her violin home and proudly took it out of the case to show it to me and Nancy, Clancy sniffed once and ambled out to the kitchen for a snack, and Clara yawned and went back to sleep with her head on the couch armrest. Jill picked up the violin for her first practice at home. She played the first note of Mississippi Hot Dog. "What's that?" I asked her. "It sounds like Twinkle, Twinkle, Little Star." "It's Mississippi Hot Dog, Mom. We played it in class today" Her tone of voice discouraged further questions, so I didn't ask any. I just tried to listen to the screeching that sounded like long fingernails sliding across a chalk board or a table saw attacking a stubborn piece of wood. After Jill played two notes, Clara scrambled off the couch and ran to her refuge under Nancy's bed. I knew she was huddled in the dark right hand corner under her blanket, so I didn't worry about her. Clancy turned out to be the worry. He stayed and fought. He took Jill's sweater sleeve in his teeth and pulled. Jill stopped playing and told him to stop. Clancy didn't stop. "Mom, make him stop," she said, producing the table saw sound again. My hands twitched, desperate to fly to my ears. I clenched them by my sides and helped Jill sing, "Mississippi Hot Dog, Mississippi Hot Dog, Mississippi Hot Dog, Mississippi Hot Dog," as she played. Clancy howled along with us. I finally had to carry detach Clancy from Jill's sleeve, carry him to the front porch and shut the door to the living room. Clancy didn't surrender. He just tried to drown out Jill's playing with his howling. Jill tried to drown out Clancy's howling with her playing. Nancy tried to stop Clancy's howling and I tried to stop Jill's playing. Nancy bribed Clancy with five dog biscuits and I bribed Jill with five dollars and the promise of the Dairy Queen after supper. Temporary bribery solves problems only temporarily. The next day and practice time came. Jill still screeched, Clancy still howled, and I still wanted to run but parental guilt and ambition glued me beside her. Nancy looked at me after the first note. "This makes me want to laugh," she said, laughing uncontrollably as she fled. I came out of the shadows and shouted for the people at Carnegie Hall to get back into their seats and listen to my daughter. My dream dissolved into Jill's tears. "I don't sound good. Nobody wants to listen to me," she sobbed. "It takes practice. The more you practice, the better you will sound," I told her. "How can I practice when Clancy howls and Nancy laughs and you give me five dollars for the Dairy Queen to stop?" she asked. Just like Suzuki, I introduced a radical change and varied my approach. There were two bedrooms in Nancy's attic and every day when she came home from school, Jill and I went upstairs to the attic and closed the door. She practiced the violin, up in the attic with the door closed. Eventually, we tuned out Clancy's howling downstairs. We got used to Clara running to the bedroom as soon as she saw Jill pick up her violin case. Nancy and I both found ourselves singing Mississippi Hot Dog while we set the table for dinner and washed dishes afterwards. The only tune I couldn't change was Mississippi Hot Dog. Jill played other songs, but Mississippi Hot Dog was still her favorite and the one she played more often. My ears rebelled, but my heart stood firm, and so did our practicing practices. Find a place away from family activities and distractions like TVs and telephones to practice. Try to practice consistently at the same time each day. Play daily. Suzuki says, "Only practice on the days that you eat." Plan what you want to accomplish in each practice session. With a bit of rearranging, the word note changes into tone. With much practice, Jill gradually achieved the tone that Suzuki proclaimed is the goal in his method. With more practice, she sounded better. Clara stopped hiding under the bed. Clancy stopped howling. Nancy hummed Mississippi Hot Dog instead of laughing and running. I stopped imagining Carnegie Hall and embraced the more practical local symphony orchestra, varied music, and fun times playing together at nursing homes. Music greased the passing years. Now that she is grown up both time and music wise, we still make reasonably good music together, but she increasingly creates her own songs. Thanks to Suzuki, she has a competent bowing technique and a beautiful heart. Barber, Barbara, American String Teacher, Autumn, 1992. "Traditional & Suzuki Teaching: A Comparison." Bradley, Jane, American Suzuki Journal Vol. 33, #3, Spring 2005. "When to Twinkle- Are Children Ever Too Young?"